When I create a RGB document in Designer and export it using one of the following presets, it always gets converted to CMYK, even when explicitly setting its colour space to RGB. Is this a known bug? I could recreate in both AD and AP in 1.5 and 1.6 beta 1. Thats no bug. The PDF/x formats are' press ready' formats, and so allways in CYMK, a must. I agree about X-1a, but I beg to differ about the others. As I understand it, not only do PDF/X-3 and 4 fully support RGB , it's actually contemporary best practice to keep pixel images in RGB until the last step in the process (which would be the RIP of the printer) . Let's put it this way. Serif's implementation and/or the library used is limited to cmyk in PDF/X types that allow for mixed content. We preserve RGB images in PDF/X-3 and above, where we can. The main colour space, however, has to be CMYK or Grey, and vector colours are converted to that. 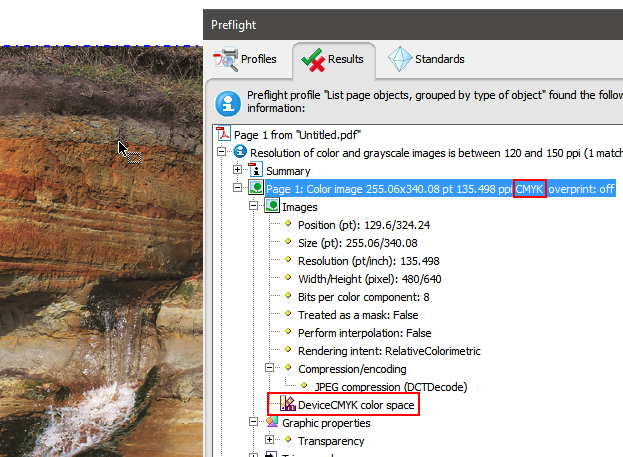 How does one get an RGB image to both hit the PDF as RGB, and, preferably, be a tagged RGB image using the profile embedded in the image? Or, at least tagged with the RGB profile of the AD document? Thanks for the answer! I see now that RGB images are being kept RGB while vectors are converted indeed. It seems my tests were poorly made; I only used vectors. Is the converting of vector colours a technical limitation of your pdf implementation or a deliberate choice? It's a deliberate choice. One issue is that if we have to rasterise a vector area, we have to pick a colour space in which to do that, and using the target CMYK space of the PDF seems best. If non-rasterised vector colours don't use the same space, they'll look different. Did you try your test with the 1.6 beta? I believe there were bugs in 1.5 that were too restrictive about what RGB profiles they would accept. You also need to make sure the image doesn't get rasterised. Other than that it should happen automatically. Ah, thanks Dave. nope, I wasn't using the 1.6 beta as I had the release running already making stuff. As this post seems to be in the general release bug section, not the beta bug section, it didn't click to try the 1.6 beta.